Its super neat that you had comics to tell the story! I caught all the cat girl monsters so I guess I'm a cat girl master now. 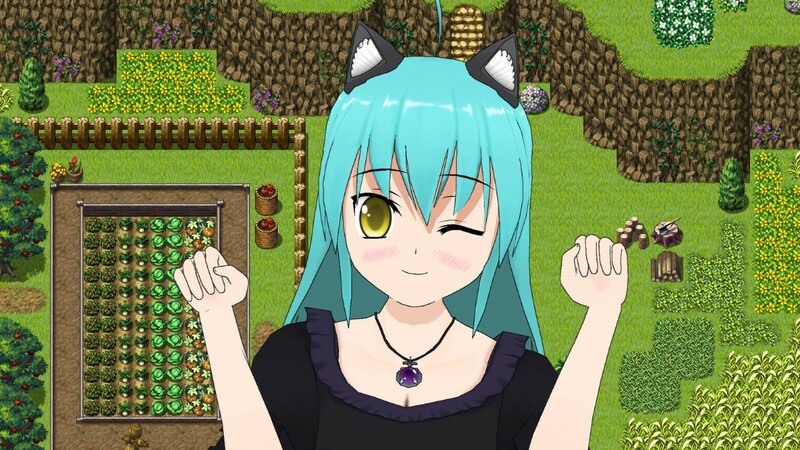 Making a game which takes inspiration from the "new life in another world" genre isn't something I would have run often into, at least when it comes to RPG Maker games. Therefore Isekai Anthology felt both refreshing and amusing to play, especially since it doesn't take itself too seriously (I chuckled a little at the main character's hopes for more character development). The story and premise for the game are relatively light - become a legendary manager and make sure that the café produces enough money so that isn't closed down - but provides a sound basis the combination of different game elements: gathering, crafting, combat and exploration. The story is partly told with comics, which is quite an interesting idea and goes with the anime/manga-esque genre, and I found the characters to be quite amusing and in a way "tastefully cliché": not too overdone but yet recognisable stereotypes from the genre. One of my favourite things in the game was its mapping. Both indoor and outdoor maps are not overly large yet not too small, either, and thanks to good decoration, they look pleasing and are interesting to explore. I also liked how the gathering and crafting system had been implemented to the game: as the UI clearly shows which objects are harvestable, there is little need for blindly clicking on every cave decoration etc., and the crafting system was simple enough not to become a chore yet offered a nice variety of craftable items (and ways to obtain the ingredients). All in all, I found the café management part to be a nice addition to the typical JRPG dungeon crawling and battles, and it could be interesting to see how that aspect develops further in the future versions. If there was one aspect of the game which I didn't enjoy, it was combat. Most of the battles felt too easy and could be solved by spamming the Attack button because the enemies hit for very little damage; the only exception for this were the ghosts with the Thunder spell. The worst offenders are probably the bees: they usually come in large packs, do 1-10 points of damage but also require 2-3 hits to defeat, which means that the battles can last a couple of minutes but offer little to no challenge. While the addition of elemental weakness system adds a bit more tactical depth into the battles, there didn't seem to be any other way to discover an enemy's weakness besides blindly trying everything, and I found it confusing how different level (and colour) enemies could have different weaknesses. Part of the criticism towards battle system can probably be explained with the game's other flaw, namely lack of polish. The game had some minor bugs, glitches and typos, and for instance, Hiroto's skills seemed to be straight copies of the default Hero class skills whereas the other characters had custom skill sequences for their spells. The lack of polish is somewhat understandable due to the creator becoming ill during the contest period, however, and most of the bugs should be quite easy to fix. Unfortunately due to real-life complications I was unable to play through the game more than once, but I spent a couple of hours running around and trying out various things. In the end, I feel like the demo shows promise. If combat is developed further and various small tweaks are done after the IGMC contest period is over, I feel that Isekai Anthology could become a very interesting game, especially to fans of the isekai genre. Final verdict: 3/5 - While I might not be able to unconditionally recommend the game due to my issues with the combat system and such, I found it amusing and had mostly fun playing it. Hopefully it will be developed further! Thank you for the comprehensive review. I do believe you hit the nail on the head, as combat (and polish, really) was where the clock had finally got ahead of my making capacity. Work is definitely continuing in the background, a good portion of which is towards the weaknesses you've found. Again, thank you for listing out things the way you did. Interesting game. Here's my playthrough. I will look and see if there is anything I can do about stability. If I had to guess it's a memory issue, and I'll just see what I can do (there is optimization already used, so maybe there is something that I can do from that angle to address that). Anyway, thank you for the review, and I will continue to work on the title. Hi, it's me, B Your Secret Santa! The main menu looks solid. It's completely different from the rmmv standarts, so that's good. Music is okay as well. I like how there's some explaining what moe culture is about so non-NEETs(LIKE ME, I SWEAR)understand the important things about the game. Good thinking! Okay, I'm loving this already. I love the idea of narrative in comics. It's a little short and rushed, but that's what you get with just one month of programming right? The art style is neat overall. The busts look good, tiles look great, love how the mapping is done as well(layered). Battling looks great! Although, all the zooming in and casting, does take up a lot of time.. That will get boring after a while. Especially since enemies don't die in one round. The gathering part is nice. I like how some ingrediënts require battle to be obtained. The battles overall take a little too much time for my liking. Especially so early on. Maybe it's because of all the animations, but I'd definitely tone down the lenght of the earlier battles, either by reducing animations, or just shorten the rounds a battle need. The difficulty is a bit too easy early on. The first enemy that actually did some damage were those ghosts, and only when they appeared in pairs. Nothing wrong with that really, but since you spend a lot of time in battle, it'd be nice if the choices you make during the battle, actually matter. I don't get a different vibe from most of the catgirls. Sure, they are all cute, but I can't really say one has a different character archetype. They all seem.. similar to another. I think in a game like this, having a good contrast between girls is very important. The overall ambiance is good. I like how there's a big contrast between the village and the forest for example, how things suddenly get so dark. I have to say, there is a LOT going on in this game. Everything you've done looks complete, finished. It's kinda amazing you managed to do this all by yourself in one month. So kudos for that! I enjoyed the manga-like cutscenes and characters. That was a nice stylistic choice and a great way to present the story. The effort was worth the result, I'd say. encounter rate was really high. I ran away from most of these battles. Overall, this was an upbeat and lighthearted experience! TOTAL PLAYTIME: 55 MINUTES. I mean meowinutes. Also, I didn't pay the taxman because I'm secretly an outlaw. That's one truth the catgirls don't need to know...don't ask, don't tell. FINAL VERDICT: The graveyard implies there's death in this universe. From the start the main menu and it’s background are pleasant to look at. The buttons have information about the game on them. Easy to use AND informative. 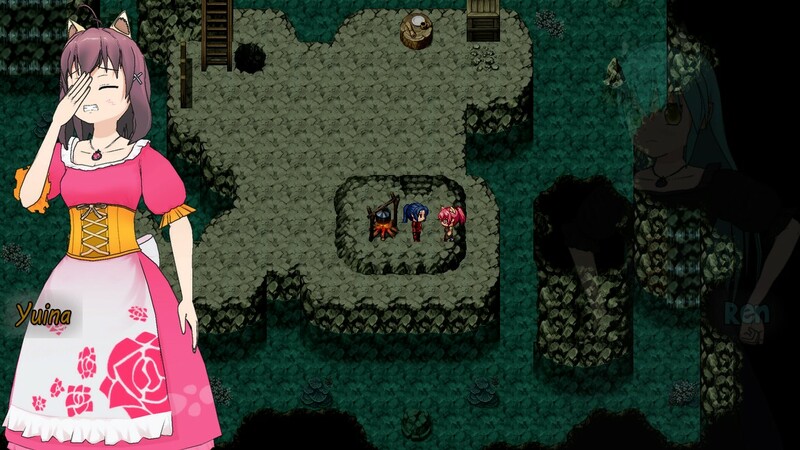 Intro: I love the comic book style intro, you don’t often see that in RPG Maker games! What blew my mind was the fact that it auto zooms in so smoothly and scrolls over to the next panel. I was really surprised it was even possible to do in RPG Maker MV due to how sometimes the picture part of events can hard to do. I love how you can read each panel at your own time without hindering the game and how each character is distinguishable. It tells of a plot kind of like reincarnation, which to me I always like the idea of in games. Music: Cute and happy, I like the kind of Irish/folklore feel. It's not to loud or quiet the sound effects aren’t ear breaking loud nor so quiet that you’d have to turn up the sound. It can be changed at any time in menu or main menu. Basement Chest: Good position, it's not 100% hidden but not easy to flat out spot, it took me a moment to find it! It was fun to do so too! Cafe: The layout is very nice, it looks like a nice small cafe with a dining area where you can chat with friends over coffee. The lowered area in the cafe is VERY adorable with the stones in patterns. 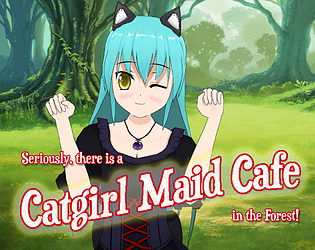 I like how at anytime you have an objective the catgirl in the cafe will tell you what it is. It comes in handy if you say leave to do something and come back several days later to have her tell you what your latest objective was in case you forgot. Outside Cafe: I love how there's icons that appear when you can interact with objects/things, it helps differentiate what's a background piece and what's intractable! I like how the rainbow moves when you do, it kinda feels like it's moving through the tree leafs while you explore the area. Cave: I thought they used the mushrooms to make the flavored ice...Mushroom flavored ice xD The harvest icon is really helpful within the cave! Battles: I love the words that appear instead of a shaking screen or fast flash to black. I love how in my first battle (2 bats) and when they where defeated the sprite didn’t vanish they had a defeated pose. I don’t often see that in games so I really like it. If you dash it may seem like a lot of battles but if you just walk it's manageable, and you don't feel swarmed. I like how they are paced. I love the bridge in the cave, I like how it sounds when it appears. After you rescue Fuyumi her sprite still shows the scribbly bubble. I love how Ren just sneaks up behind her like "aye ck-ck-achu I helped to!" 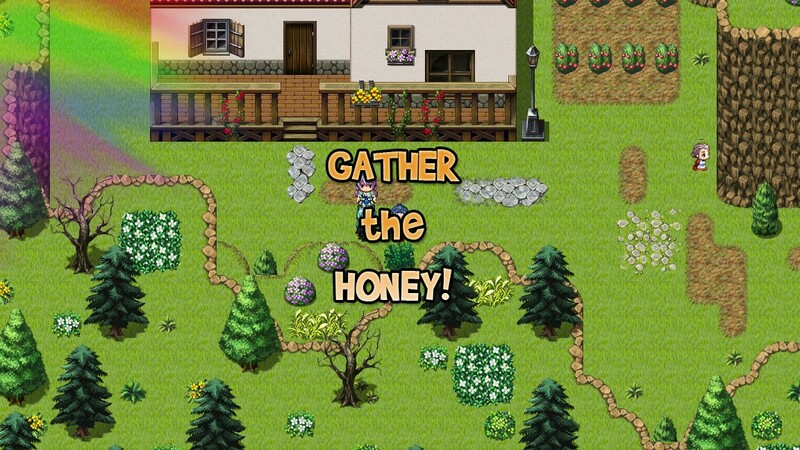 Cafe recipes: It makes a scroll noise but doesn't do anything Collect honey from the BEE? -- This worries me I love the game’s idea I cannot wait to see the full version <3 Have fun developing! Whatever about nekomimi, I LOVE IT!!! I have been following the development of this game since "Sauce" started this up for the contest. I know a lot of effort to make a unique game was put into it! I was sorry about the whole flu thing, because that limited the time available for things to be polished the way it could have been but overall I found the game to be a fun and laid back gameplay concept. 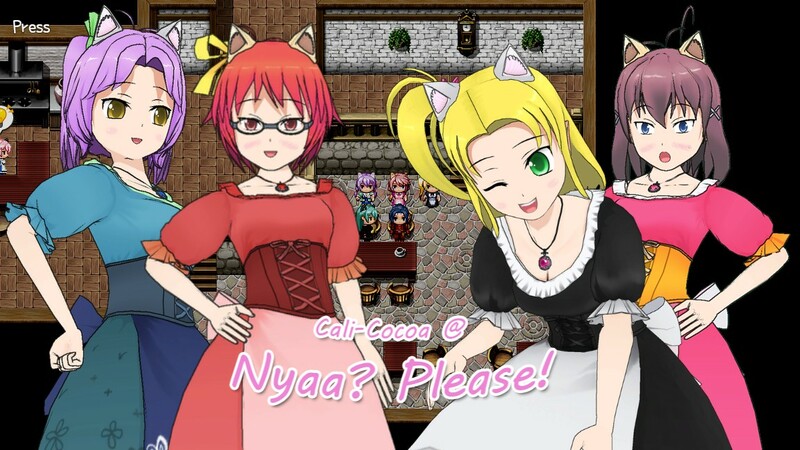 Kind of a Stardew Valley feel except with Cat-Girls! The Manga Comic Cutscenes are a great reward for reaching the next area and I was impressed by how well they made the game stand out. I'm a real cutscene nut myself and these ones impressed me in a new way. This a gem in the rough that I hope gets developed further into a full game after this contest period is over. Focus is really not on strategic combat (yet) and the storyline is not dark or ominous. I would rate it as a humorous or lighthearted game in its overall presentation. I'm sorry to hear that illness prevented you from adding in the cafe elements (I was really hoping to check those out! ), but I hope you're feeling better now! There are a lot of elements of this game that I enjoyed in concept, but also quite a few weaknesses as well. The comic book style storytelling is very unique and cute! And I like how many poses you could get for each character by using 3D models for their bases. 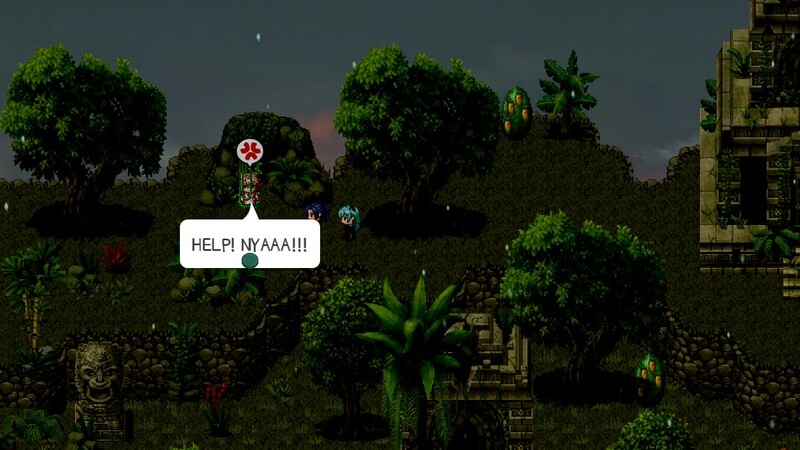 It's not something I see very often in RPGmaker games, and I think it had a lot of charm. The girls' designs are cute too! I'm a sucker for gathering materials, though I laughed that I could just take whatever I wanted from that farmer's garden. Free tomatoes for life! Due to the cafe elements getting cut, the gameplay ends up being focused on the dungeons. The dungeons were... not that exciting. Combat was very easy; enemies only ever did 1-3 damage and could easily be killed with nothing more than basic attacks. (I used the MC's spark move only when there were a large number of bees.) I'm not a huge fan of the game switching between random encounters in dungeon 1 and on screen encounters in dungeon 2 either. The first dungeon layout was a lot more interesting. The second dungeon was mapped nicely, but the layout itself wasn't as neat. The writing was... not for me. Maybe it's my general disdain for isekai, but it came across a little childish for me. and while the comic book format is great, the regular conversation scenes having name boxes moving all over and displaying more than one on screen at a time made some things hard to follow. I really enjoyed the mapping of the town and first dungeon though! It's always nice to see use of elevation in maps. Congrats on completing your demo and submitting it! Thanks for the detailed write up, I appreciate you taking the time to share you thoughts. Both the criticism and the kudos are happily accepted as they will help me make better things going forward (and to bug fix this after the "jam" is over). I'm especially appreciative that you took the time to comment on a game that is not cut from the same chord that you would normally play. Thanks. On another note, I know the battles aren't balanced very well, this is something that I have been struggling with. I hope to eventually come up with a methodology that works for me, and will provide more of a challenge without hitting the frustration level for a player. Anyway, thank you again! I really appreciate the feedback! I really liked the comic cut-scenes. Thanks! They were fun to implement too! Well, it was pretty interesting storywise. Not really sure where to find the rest of the maids. Combat is a pretty much the same, with a bit of magic actually hurting me later on. Artwork is great, love the manga style cutscenes. Nice work.